Death is the most absurd thing in life. This is the basic premise behind Exit the King by Eugène Ionesco, currently being produced by Soulpepper Theatre at the Young Centre. I found the play to be a little absurd myself, though probably not in the way the playwright intended. The story is one in which King Berenger the First, the 400-year-old ruler of a fictional kingdom, is told of his impending death. (I believe the exact words are “You are going to die by the end of this play.”) He and his royal court spend the rest of the show processing this. We go through the stages of grief with the King – denial, sadness, acceptance, etc. – and I don’t think it’s spoiling anything to tell you that he does indeed make his Final Exit at the end. The play is translated from French by Neil Armfield and Geoffrey Rush (yes, that Geoffrey Rush, who also performed the title on Broadway.) Ionesco, for those who don’t know, is considered a master of absurdist theatre. This is evident in many of the gibes the characters make, the self-awareness of the premise, as well as a sort of pathetic fallacy in which the kingdom and the land begin to die along with their ruler. Now, even though I may not be an Ionesco fan, I am a Soulpepper fan and they did not disappoint me. (Except maybe in their choice of play.) I thought the acting, direction and design were all superb. Oliver Dennis, who I had only seen in supporting parts previously, was a great King Berenger, funny or sad or pompous at all the right times. The other stand-out for me was Brenda Robins, who plays his first wife, Queen Marguerite. It was great to watch her interactions with Berenger’s younger, prettier second wife (Karen Rae), and she carries the previously mentioned final scene. So, what did my show partner, Sarah, think? She loved the show, enough to get exasperated with me when I said I didn’t. But then she floored me by adding “But I wonder if I would have liked it as much if I felt closer to it” – meaning if she was older or sicker and closer to death. It’s a question I thought about for the rest of the night, which is all a good play can ask. So… touché, Ionesco. But I’m still not going to reread Rhinocéros. 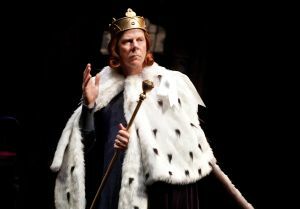 – Exit the King is playing at Soulpepper until September 9, 2011 on various days of the week. Matinees begin at 1:30pm, and evening performances at 7:30. – Performances take place at the Young Centre for the Performing Arts, 55 Mill Street, Building 49. –Tickets are $28 to $65. They can be purchased online or by calling the box office at 416.866.8666. Rush tickets may be available an hour before showtime.